“For every 100,000 live births, there is an estimated 16.33 babies found abandoned illegally in 2011, compared to 13.06 babies in 2007,” said Dr Salmi Razali, a psychiatrist and senior lecturer at Monash University. She was speaking about the high number of baby abandonment cases and it is suspected that the figure is much higher now. The actual concrete statistics of parents abandoning their children after birth is hard to tally, considering that not all babies that are abandoned can be found. The lack of proper sexual education as well as negative influences from uncontrolled circumstances has only further exemplified the statistics drastically until it now poses a serious issue for our community. Dato Adnan Mohd Tahir and his wife, Datin Elya Lim, two orphan activists who witnessed many children being orphaned in Acheh after the 2004 Boxing Day tsunami, used this experience to help solve this problem with their own method. The couple first decided to help by spreading word around about these Acheh children in desperate need of new families to be adopted into but due to nationality issues, they had to abandon the idea. Rather than be discouraged by the turn of events, and seeing how good the response had been to the Acheh appeal, they decided to gather a few friends to do something for Malaysian orphans instead. That was how OrphanCARE began. OrphanCARE was established back in 2008 as an NGO before they were accorded Foundation status by the Prime Minister’s Department in 2012. The organisation works hand in hand with the Ministry of Women, Family and Community Development to realise their mission of placing orphans into loving homes and providing refuge for unwed mothers as well as a safe haven for abandoned babies. “Our first baby hatch was set up in Malaysia back in 2010 to receive babies who might otherwise be abandoned. An additional two baby hatches were set up in Johor Bahru and in Sungai Petani Kedah so currently we operate in these three states,” said OrphanCare to Vulcan Post. After making a visit to their facility located in Kampung Tengku, Petaling Jaya, I noticed how the team considered a lot of factors when setting up their establishment. 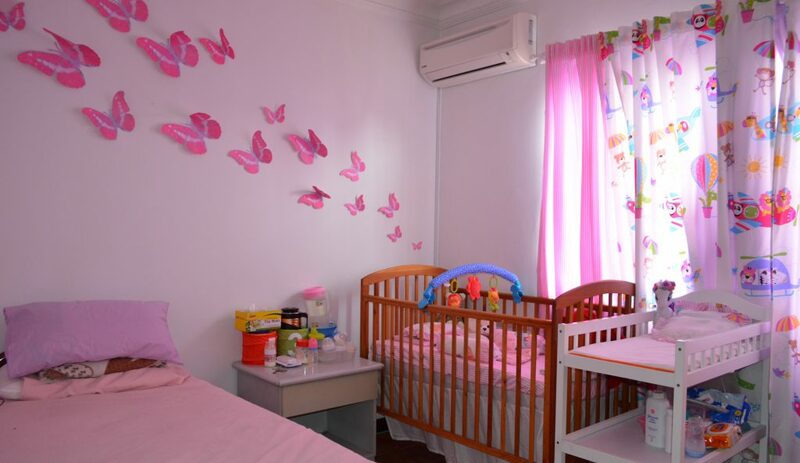 Besides the baby hatch, they have rooms inside that accommodate their other services such as quarters for their caretaker who is on-watch 24 hours as well as a room specifically for counselling and general care for the unwed and expecting mothers. “We began our pilot project in 2014 which saw the reintegration of children with their Birth Families. We provide families with the support they need to adopt through ethical adoption services, and counselling,” said OrphanCARE. At present, they have 20 staff including two staff stationed at OC Johor Bahru and two staff in Sungai Petani. Five of the staff were with OC since 2010/2013 and the rest came in 2015. To date, OrphanCARE has managed to save 147 babies and helped to counsel 87 birth mothers who decided to parent their child after receiving their guidance. 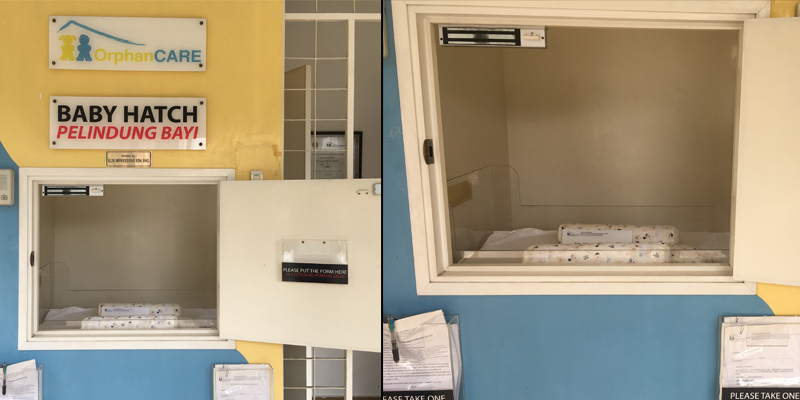 Upon arrival, the first thing that caught my attention was their baby hatch which is situated right in front of their establishment, making it easily accessible. The OrphanCARE team shared that the gates to their centre are never closed which allows parents to enter the premises and access the hatch any time of the day. When opening the hatch, I saw how the space inside was large enough just for the baby and the layout was planned to accommodate the child well. The little cot was prepared with a soft mat and some pillows. A special sensor beneath would be triggered by the weight of a baby, turning the air conditioning on. Once the baby is placed, an alarm will alert the caretaker inside the house. He or she will then hurry down to pick up the baby from the hatch and tend to the child immediately. Beside the hatch, there is an intercom for the parents to communicate with the caretaker if needed. One thing to note is that once the door of the hatch is shut, it can not be opened by anyone other than the caretaker which ensures the safety of the baby. There are also forms provided in three languages widely used in Malaysia for the parents to fill in with any information if they want to. I believe that the real appeal of the hatch is that it provides the parents a sense of comfort knowing that their baby would be in good hands. If they’ve already gone through the effort of wanting to place the baby in a safe hatch rather than going the illegal route and just dumping it in a random drain, that shows a sense of responsibility and care on the parents’ side. OrphanCARE shared how most babies placed in the hatch are mostly newborn, some even with their umbilical cord still attached. The team will evaluate what kind of medical needs the baby requires before sending him or her to the hospital and then tending to it in their facility. The adoption process afterwards is dependent on a few factors, such as if the parents had left a note on the baby’s religion and nationality. It also depends on the availability of the babies considering the list of waiting parents grows day by day. “From the time they sign the adoption paper, Muslims would need to wait 2 years in order to get ‘Sijil Anak Angkat’ while for non-Muslims, it can be done within 3 to 6 months. To be in our waiting list, couples would need to send us an e-mail and state their interest. From there, they need to fill in forms, attend Potential Adoptive Training as well as an interview,” said OrphanCARE. Although they’re gaining traction now, they initially faced some challenges as a negative perception regarding baby hatches existed. They had to work to educate the public and create awareness of how serious the issue of abandoned babies is. “At first, we depended on word-of-mouth to help the public be aware of our service. But then we realised that we had to come up with a better effort so we’re now giving reproductive health talks to university students, starting outreach programs in clinics and holding awareness talks at corporate companies,” said OrphanCARE. The organisation hopes that with their service, it can help not only parents who are forced by circumstances to abandon their babies but also change society’s mindset towards orphans in general. “People need to see that children should not be left permanently in orphanages. It should only be considered as a ‘transit point’ before being placed with families who can bring them up in a proper family structure and home environment. In order for children to grow up with a bright future, the first few years are the most crucial,” said OrphanCARE.